An interview by Fabien Delmotte of Marisa Holmes, Mark Bray, Nathaniel Miller and Jason Freedman about the occupy movement. In 2011, the Occupy Wall Street movement spread in many towns in the United States and attracted media attention at an international level. In the context of our inquiry into social movements in the United States (which has already led us to present Black Lives Matter), it was interesting to meet some of the organizers of what is one of the most noticed social movements of these last years. These interviews therefore try to make a critical and constructive assessment of Occupy Wall Street, which can particularly arouse interest while a movement of occupation, comparable in certain respects, aims to spread in France in the context of the protests against the El Khomri Law. Marisa Holmes has recently directed the movie All day all week: an occupy wall street story and is one of the initiators of the movement (see David Graeber, The Democracy Project : A History, a Crisis, a Movement, Spiegel & Grau,‎ 2013 ). Mark Bray was also particularly involved in New York and has since published Translating Anarchy- The anarchism of Occupy Wall Street (Zero Books, 2013). Nathaniel Miller and Jason Freedman Were involved in Occupy in Philadelphia and Boston and show in this interview, through these examples, how the movement spread and developed in others American towns. Mark Bray : I think that part of the importance of Occupy was the context in which it emerged which was relatively low in terms of radical political activity in the United States. I think it reignited a sense of possibility of popular social movements, popular social struggles, social transformation. All of these things which have been relatively dormant became more part of popular consciousness through Occupy and it had an influence on some social struggles which have come subsequently. And I think it has also been influential in terms of getting a new generation of radical youth involved in politics. These 2 examples show its relevance although it's not around anymore. Marisa Holmes : There were various actions after Occupy... For example, Occupy Sandy was a response to the Hurricane Sandy, when it happened, there was a relief organization and network. There were assemblies, neighbourhood level work. There were projects on housing like Occupy Homes and also things which were not called Occupy but were related to take over, occupations... I really think that Occupy Wall Street was a kind of convergence at a lot of different emerging movements. They all have a common enemy. So people went back to organize in the different sectors they came from, back to the neighborhoods, back to the workplace, they went back to anti-police work, etc. But it's not like Occupy gave birth to all these things, people were already organizing in these areas but Occupy strengthened the networks, radicalized them. Mark Bray : In more general terms, even things like the fight for 15 campaign [15 dollars an hour for fast food workers], Occupy helped to bring a sense of activism to the labour movement to a higher degree than it had. So I don't think it's any coincidence that it happened just after or till the end of Occupy. Or even like the Fracking Resistance, environmental things, I think Occupy helped them a little bit. Black Lives Matter, of course, developed its specific issues, but still Occupy created further ground for protest, for being on the street, for having actions in different cities related to something going on somewhere else. It helped to create a climate that was one factor, even a minor factor, for these other things. Marisa Holmes : Before Occupy, people got permits to do things, for rallies, marches... After Occupy, especially among young people, this is just not something people feel the need to do. I mean, certainly the established labor unions and other forces in the city get permits but not Black Lives Matter. There were thousands of people in the street on the bridges highways, we used mobile tactics and direct actions even without thinking about it. There was a new sense of normal for what was accepted tactically even though people may not have had the idea behind them. That's not an ideological position but people are more comfortable with militant actions. Marisa, you were one of the first people involved in Occupy Wall Street and you have made a movie about the movement (All day all week: an occupy wall street story). How did the movement begin ? Mark, when did you decide to join the movement ? What was your main activity in Occupy Wall Street ? Marisa Holmes : It began at Bowling Green Park in the Financial District of Lower Manhattan on august 2nd. The group New Yorkers Against Budget Cuts had been part of the Bloombergville occupation organized that earlier in the summer...Basically, people came, didn't want to listen to the rally and were opposed to the way they were doing things. These people wanted to form an assembly, so they broke off and that became the New York City General Assembly. I joined this group. Every Saturday, for 6 weeks, we talked about an occupation, we learned to know each other and we drafted a statement that said we were horizontal, participatory, and autonomous.The intention was that the action was the process itself, it was prefigurative. You have to remember that this was in the context of global squares occupation, particularly 15M. Some people were really influenced by 15M, by process as a mode of action. Mark Bray : Seeing the kind of increasing support it received in the society, from unions, from different segments of society, the popular interest in issues of police brutality, like the «pepper spray incident» in late September, I liked the atmosphere more and more. I decided to come regularly, the Brooklyn Bridge March made it even more interesting and I finally I thought there was something there and I wanted to support it. Mark, you've written a book about Occupy called Translating Anarchy: The Anarchism of Occupy Wall Street. What do you mean by that ? Mark Bray : The reason I chose the title is that I argue that Occupy Wall Street succeeded in being both radical and relevant to the lives of working-people in New York because it managed to translate anarchist ideas and practices into language and way of organizing, making decisions and planning actions that people could engage with and find to be relevant to their situation and didn't turn people off with the ideological baggage of the radical banner of anarchism. I did interviews with nearly 200 Occupy Wall Street organizers in New York, asking about their political perspective. 39% of the interviewed self-identified with the term «anarchist» and another 33% had politics that I would say very similar to if not identical to anarchism. So, there were about 72% of the organisers in New York having explicitly or implicitly anarchist politics. So despite what the media said, anarchism was the central ideology amongst the core people of Occupy Wall Street. But there was a difference between people involved in a daily basis in Occupy and people sometimes showing up, or casually participating to a march, in terms of perspective and politics. That's why the media saw Occupy as an essentially liberal mainstream movement, ignoring the radical impetus behind it. Jason Freedman: When Occupy happened in the United-States, after the occupation in New York, Boston was one of the quickest to respond in an occupation. The occupation happened in front of the Federal receiver building(a Federal Bank). The square is called Dewey square. A lot of anarchists were involved from the very beginning. Some groups who were involved were Food not bombs, Anarchist Black cross, the Boston IWW and Common struggle (now part of Back rose Anarchist Federation). They were very involved in logistics, the food, etc. Occupy changed the political landscape in Boston, marching in the street became normalized, anarchist ideas became normalized, people were interested in anti-capitalist ideas but after a while, the capacity to keep the camp going was too much for a lot of the occupants. And the weather didn't help. There was talk about occupying a building but folks never got that serious about that. The idea of a building occupation definitely grew. Nathaniel Miller: Like in hundred or maybe thousand of cities, there was an active Occupy movement in Philadelphia. Not as known and large as the one in New York but it was a large and organized, with a couple of thousands of people involved. It was not very sophisticated in its analysis but it helped to critic capitalism which usually in the US doesn't exist. The average american is still extremely pro capitalist in its analysis. So it helped a beginning of critic of capitalism. The legacy is mainly this critic. There are sometimes some «clichés» concerning Occupy Wall Street. For example, there's this idea that it was just a kind of student movement or intellectual movement, not very linked to working class issues, etc. Do you think it's just a caricature or is there some truth in this presentation ? Mark Bray : It's indeed a bit a caricature. Thousands of people have participated across the country. It's certainly expand numerically beyond that kind of description. A lot of unions supported and some came out to it. 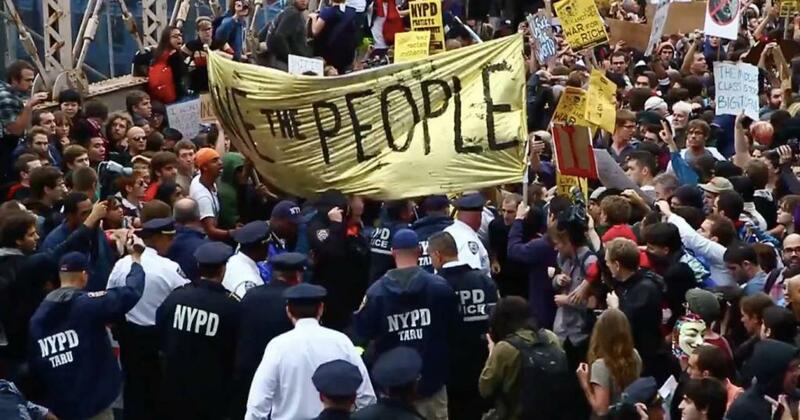 At one point, I think opinion polls show that it was 50% (or maybe more) in New York City had a favorable impression of Occupy’s message. But I do think that, to some extent, Occupy failed to sufficiently ground itself in everyday struggles in many cases. It developed a bit of a gap between the average working-class persons and how they perceived Occupy to be as so far as... You know, when you came, I don't think there were enough links to improve this, more links would have been helpful. But that reflects on how we organize, how we set up to begin with and the composition of people who are in the park and who are participating in it. On the other hand, I do think that the radical left in the United-States tend to be relatively highly educated. You can't portray Occupy as just being that, but I think it has an influence on Occupy in some cities, like New York. Marisa Holmes : That is true concerning the left in the US. But Occupy was much, much better than usual. Because of this tactic of occupation, it was open, actually. People who didn't have this radical background, didn't have the education, didn't have the ideological knowledge going in... People who were living on the street or travelling kids, etc were part of it. And that's not part of what I see now, actually. There’s a more closed organizing environment. When I went back recently to Liberty Square to film my movie about Occupy Wall Street, I talked to one of the men who works for Brookfield property, a company who also manages the security of the park, as part of the privatization of the city. The man, the guy was like «oh ya, Brookfield, they're ready for you guys», you know they still actually think that we'll come back (laughs). They just installed two new security cameras. And the guy was like «you should come back, we will be paid overtime if you come back» (laughs). And «we are supporting you, actually». Because this was obviously related to workers, they aren't high up in Brookfield and he understood very well. You know, this guy actually worked for Brookfield... You know, the cause we're talking about the 99%, the 1%, is like wealth... So this guy tells me, you know, «they take everything, they don't leave anything for the rest of us». I don't know, people understood at a very basic level that wealth needed to be redistributed, that they needed to take collective action. People did identify with what we were doing. They were the 99%. Mark Bray : Many journalists said the message of Occupy was unclear. But I think people understood pretty clearly that this small percentage of people in this country had everything. That's very easy to understand, most people did understand. It was about class but the language that we used made people feel more comfortable for various reasons than the 19th century class language they were more familiar with. I think it's important to remember that in the context of the United States, the notion that there are social groups whose interests are opposed to those of others groups is a really radical notion. We've been trained to think that ultimately, if everyone really were smart, they would realize that all of our interests point in the same direction. So that a lot of people had the notion that's not the case, that we're actually involved in a struggle, that was very radical and transformative. Marisa Holmes : And by 2011, with Occupy, you could talk about it even more in the mainstream discourse. I don't know, most people are capitalists, like in their actions. But they're probably more critical, now, I guess. Marisa Holmes : But what do we mean by politics? The mainstream media, the unions, the non-profit that came in, and they wanted to engage in politics which have to do with the government, and policy changes But we were engaged in everyday politics, self organizing our lives. That's actually what got missed from Occupy. Not just the ideas of anarchism but, you know, people were living in the park and they were self-organizing their lives with some energy, figuring out how to feed themselves, and house themselves. Even though it was a symbolic occupation, there were real material things happening there. That was what it was about : everyday politics, everyday revolution. However, I do think that the identity of the occupier became too static to the degree that a lot of working people felt that they might support Occupy but they won't themselves occupy, which was limiting the potential growth of what we were doing. In a constructive way, what can we learn from the limits of this experience ? More generally, if we don't want to focus only on the good aspects, what are the other constructive critiques you would raise today concerning Occupy Wall Street ? For example, Mark, you talk in your book about the issue of the «liberal libertarians». What do you mean ? Mark Bray : A lot of people had this residual of American individualism that they mix with underdeveloped anarchist or libertarian in the original sense of the term- notions of opposition to coercion, inclusion, taking individualistic direction sometimes ended up precluding the possibilities of making the though decisions to exclude people being actively destructive or working against the interest of the collectivity, against certain kinds of decision-making that embody the structure that can prioritize the people who actually are affected by the decisions being made. They dismiss the decision-making method that would make directly democratic structures possible. Things like that, I think. No organization or solution could do away with this entirely, some could do better than others, but it, I think, shows the kind of political culture that we're dealing with in the United States. Marisa Holmes : There were a couple of key challenges, I would say. Growth, scale of organization, structures, relationships linked to that growth, all forms of internal oppression, race, gender, heteronormativity, etc. And also dealing with the police presence, the level of oppression... We were not adequately prepared for any of these challenges. I think that we tried in the moment, under siege, to deal with them... But if I would have the possibility to do it over again, I would be prepared for the possibility that people might actually come. We didn't believe that people would come... We thought we would shut down after three days max. We hadn’t anticipated that maybe, actually, people would be interested by our ways of doing things!